Manu and Danny. Perfect Strangers. ~ Roundball Manor - The House that Basketball Built. In the last game of the season at the AT&T Center, the fans of San Antonio were treated to one of the greatest performances in NBA Finals history. Local superhero Manu Ginobili put on a show for the ages, starting the game and leading the team to a victory with 24 points and 10 assists. He found his form early, getting to the bucket and playing secondary point gaurd. His ability to penetrate the paint and dish allowed Danny Green to once again roam free behind the arc, going 6 for 10 from deep, giving him 25 in the series and breaking a Finals record of most three pointers previously held by Ray Allen. Manu and Danny seem to have found a rhythm together playing off of each other spectacularly as the defense continually collapsed on Manu leaving Green wide open. These two havent seen much playing time together as Green surpassed Manu on the depth chart this season playing a majority of the minutes at the three guard and leaving Manu to come of the bench in a different role. That all changed last night when Pop decided to go with four guards, inserting Manu into the starting lineup with Parker, Green, Leonard and Duncan. This lineup was able to expose the Heat defense and spread the floor, using Manu and Parker as facilitators, and leaving Danny Green surprisingly wide open all night. Manu was also able to toss out 10 dimes, finding both Green behind the arc and Duncan down low. He was a perfect compliment to Tony Parker and his 26 points. Danny Green. I gets buckets. So as the Spurs and Heat contnue to swap wins for losses, attention tends to lean towards the losing team and what they did wrong. Taking a look at Miami, they once again got off to a slow start and were never able to get over the hump. Starting Mike Miller was not the answer, and the Spurs ran a pick and roll on whoever he was guarding all night. Miller is a knockdown shooter, not a great defender and the Spurs exposed that. Moving LeBron to the power forward spot often left the team exposed down low, as missed shots saw 4 or 5 Spurs players in the paint and the entire Heat team backpeddling down the floor. A thumbs down goes to Coach Spoelstra and his poor rotation last night. Udonis Haslem played 9 minutes. Birdman had another DNP. Both of these bigs can provide a defensive presence and spark that the Heat desperately need. At one point the Heat were running with Chalmers, Allen, Wade, Miller, and Bosh. Ugh. The Heat need their biggest and best defenders in the game down the stretch. They need to give LeBron rest from getting beat up down low and play him at the 3 with Haslem and Bosh working the paint. If they can stop the Spurs from penetrating and not leave shooters wide open, they will be able to compete much better back home in game 6. As bad as the Heat played last night, credit must be given to the San Antonio Spurs. They were a complete team once again getting great contributions from everyone. Parker and Ginobili facilitated masterfully. 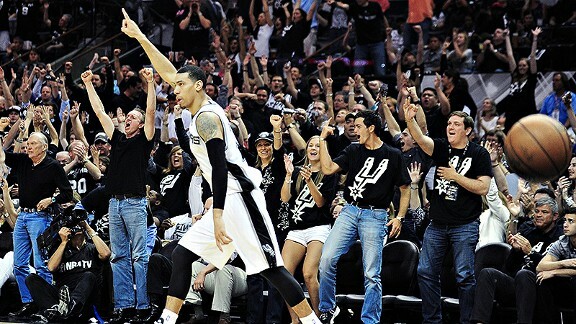 Danny Green shot the lights out. Tim Duncan was a stalwart presence down low all night. Boris Diaw played great minutes guarding LeBron when Kawhi Leonard was in foul trouble. Manu and Danny found a rhythm that hadn't been seen all year long. The wily veteran let the NBA world know he can still perform at a high level, while a young guard shattered a Finals record with 25 three pointers made. These two perfect strangers have placed the Spurs on the brink of winning their 5th title with a masterful blend of their individual talents. All eyes are now on the Heat as they will do their best to take it to a seventh game on Tuesday. Perfect Strangers. Balky Bartokomous would be proud.